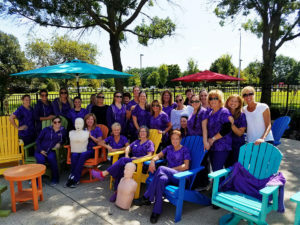 CPR Training at Newtown Dentistry for Kids - Cardiac Care & Safety, Inc. CPR Training at Newtown Dentistry for Kids - Cardiac Care & Safety, Inc. In the dental industry, recurring CPR and BLS training sessions are a necessity. It’s important for these health professionals to keep up with certifications as well as the latest information and techniques to keep patients safe in case of emergency. Group trainings are an easy way to maintain certification for the whole office. We work with many dental offices on an ongoing basis, and recently had the opportunity to work with the friendly staff at Newtown Dentistry for Kids. When planning a group training, our instructors can be very flexible to work around your business hours. We’re happy to come by your facility at night, over the weekend, or whenever works best for you. Additionally, the group environment allows us to recreate actual emergencies your staff may encounter for hands-on experience. A big thanks to Newtown Dentistry for Kids for the great session and awesome photo!